This is a picture of my fruitless sweet gum tree. 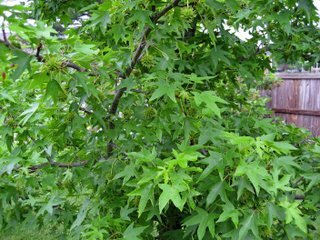 I bought this tree 8 or 9 years ago at a local nursery/garden center, primarily because it was labeled as a "fruitless sweet gum". I thought, what could be better than that!? The sweet gum (Liquidambar styraciflua) is a great tree, if you ignore the fact that it has all these seed balls that eventually end up on the ground. So, if this variety was fruitless, it would be an almost perfect tree, right? But look closely, and you will see that the tree is loaded with fruit, those seed balls that eventually all fall to the ground and leave a mess around the tree. Remember, I bought this tree at a local nursery, not a big box retail store. It was a reputable nursery staffed with horticulturalists and others who should know their trees and shrubs. I assumed everything was as labeled. So when I realized several years after planting this tree, that it was not fruitless, I decided to take a picture of the tree, along with the tag and their receipt that both clearly said "fruitless" and see what they would do for me. I just assumed that they would come up with some way to compensate me for having purchased this tree which was clearly mis-labeled. So off I went back to the nursery. I found someone to help me, actually several people all standing around together, and showed them my picture and receipt. They acted quite puzzled. They seemed not necessarily puzzled or concerned by the fact that the tree was mis-labeled, but more by the fact that there I was, after all this time, asking for them to do something to right this wrong. After conferring amongst themselves, they said they would have to refer it to the nursery manager, who was not there that day. (Ah, yes, saved from making a decision since no manager was around!) So I left my information with them, went on home, and waited for the manager to call. Two years later, I'm still waiting. It just goes to show that you can end up with a plant that isn't as advertised at either a nursery or a big box retail store. So, it pays to know your plant material before you buy. Now that I've done additional research, I've learned that the fruitless sweet gum variety is generally Liquidambar styraciflua f. rotundiloba, which has rounded leaves, versus the pointed leaves of the species. Had I known that, I would have looked at this tree with more skepticism that it was really the fruitless variety since its leaves are cleared more pointed on the tips than rounded. I still have this tree obviously, and it's a good tree with good fall color. I guess I just need to figure out a nature craft that requires all those seed balls. See My Garden Pictures for information on my Japanese Tree Lilac, which is as advertised! Didn't Dad have a sweet gum tree when we were growing up?